Shout out of the Week: Budweiser Made in Orlando & Tampa - FREE SHOWS! 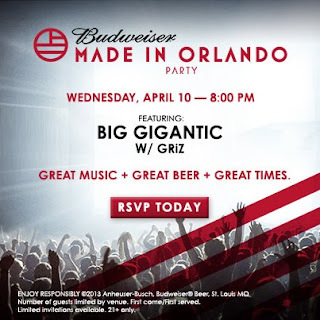 In case you hadn't already heard (and I hadn't, until today), Budweiser, the self-proclaimed "King of Beers," will be hosting two free shows in Orlando and Tampa next month, featuring Big Gigantic, GRiZ, Savoy, and Milkman. The Orlando event will be held at Hard Rock Live on April 10 with Big Gigantic and GRiZ. The Tampa event will be on April 4 at Jannus Live with Savoy and Milkman. These events are free to anyone over 21, but you have to register in advance to get a ticket. Click here to register for Orlando, and here to register for Tampa. You will need a valid ID to enter either show. Event details call for "live music, local food, swag bags, cold Budweiser and more." Sounds good to me. I'm all registered and ready to go. See you there!